Nigeria breezed through their third round World Cup qualifying group in impressive fashion after Sunday Oliseh sneaked them past the previous round with a 2-0 aggregate win over Swaziland. That was an unimpressive for a man who thinks so highly of himself. The ex-Ajax player arrived with great pomp, promising a lot and delivered little. Somewhat unsurprisingly, Oliseh left his role in acrimonious fashion after falling out with the NFF, which seems to be becoming a pattern in his managerial career. He did have good reason, though, citing lack of payment to staff members and himself. The split was probably best for both parties, with Oliseh’s side turning in sub-par performances during qualifying for the Africa Cup of Nations. After a poor Africa Cup of Nations qualifying campaign from Oliseh and Samson Siasia, many Nigerians felt the Super Eagles needed a more experienced manager and Gernot Rohr stepped in. With less arrogance and, frankly, more coaching talent than his predecessor, the rest was history. Comfortable qualification and a win against Argentina in November gave fans a renewed sense of optimism, though Nigeria have been hit-and-miss in friendlies since then. Still, a less than vintage Argentina side, a Croatia team that look vulnerable to pace at the back and a plucky but very average Icelandic squad should give Nigeria a very good chance of qualifying. Nigeria will line up in either a 4-2-3-1 or 3-5-2 and will look to attack directly. The team have looked fairly solid when sitting deep, but a mixed bag when trying to close down opponents higher up the pitch. Francis Uzoho can be aerially dominant but inconsistent in-between the sticks. Leon Balogun, a doubt for the opener, is the squad’s best defender. His likely partner William Troost-Ekong is solid but limited on the ball. At right-back, Tyronne Ebuehi is a genuine talent with speed and crossing ability. Wilfried Ndidi, Alex iwobi, John Obi Mikel and Odion Ighalo will almost certainly start the first game, with the system Rohr opts for dictating whether Iwobi starts centrally or on the flank. John Ogu with his passing ability could be a key utility man at the back or in midfield and Oghenekaro Etebo’s ball-carrying ability may come in useful, also. Victor Moses is clearly one of the better players in the squad, but doesn’t quite fit in the 3-5-2 that has brought some success recently, which may force Rohr’s and go for a 4-2-3-1. Iheanacho is unlikey to start but will be dangerous off the bench. Speed on the break and adaptability– Alex Iwobi and Victor Moses can carry the ball forward with devastating effect in their 4-2-3-1 system. The former is also good in-between the lines in the 3-5-2 and Ebuehi is dangerous at wing-back. Add in the fact that Simeon “Simy” Nwankwo is an option as a target man, this should mean that the side are flexible and should be able to change strategy depending on the game state, though Rohr has sometimes been a little late to. Weak in both boxes -Kelechi Iheanacho isn’t effective as a traditional centre-forward, meaning Ighalo is off form of late. Uzoho is shaky in goal and Balogun’s injury could be a big problem at the back. 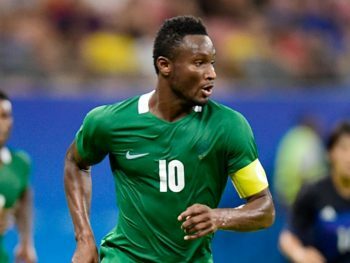 John Obi Mikel – The veteran is still Nigeria’s most creative player. He’s good when under pressure and is a very good passer of the ball. He’s likely to start as the midfielder closest to the forwards but he might be more effective dictating play from a deeper position. Leon Balogun – The 29-year-old only has 17 caps, but looking at on-pitch interactions and level of performances, he’s already Nigeria’s leader at the back and is the most complete centre-half in the pool. Gernot Rohr – Like most foreign coaches in Africa, the German is a journeyman figure with mixed success in his previous jobs. He does, however, get a fleeting mention in “Das Reboot”, a book about German football’s reinvention and he has had a role in changing the culture in the Nigerian set-up.